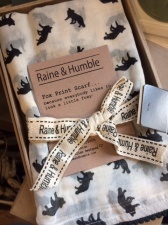 Made in 100% Indian Cotton, this beautuiful scarf has black fox sillouttes printed onto cheescloth. Featuring a trim of delicate black pom poms. Beautifully presented and boxed in a natural craft gift box. Approx measurements 45cm wide x 180cm long.